Turkmenistan is a former member of the Soviet Union located in Central Asia. Its capital is Ashgabad. 80% of Turkmenistan is covered in subtropical, sandy Karakum Desert, with dunes rising to the Kopet Dag Mountains in the south along the border with Iran. The country also borders the Caspian Sea to the west and the Amu Darya River and Uzbekistan to the east, Afghanistan to the southeast, and Kazakhstan to the north. Area: 488,100 km2. (303,292 sq. mi.). Cities: Capital—Ashgabat. Other cities—Turkmenabat (formerly Chardjou/Charjew), Dashoguz (formerly Dashowuz), Mary, Turkmenbashi (formerly Krasnovodsk). Terrain: 80% covered in subtropical, sandy Karakum Desert, with dunes rising to the Kopet Dag Mountains in the south along the border with Iran; borders the Caspian Sea to the west and the Amu Darya River and Uzbekistan to the east; borders Afghanistan to the southeast, Kazakhstan to the north. The majority of Turkmenistan's citizens are ethnic Turkmen; other ethnic groups include Russian, Uzbek, and Kazakh. Turkmen is the official language of Turkmenistan, though Russian still is widely spoken as a "language of inter-ethnic communication" (per the 1992 constitution). Education is universal and mandatory through the secondary level, the total duration of which is 10 years. Ethnic groups (2003 est. ): Turkmen 85%, Uzbek 5%, Russian 4%, other 6%. Religion: Muslim 89%, Eastern Orthodox 9%, unknown 2%. Language: Turkmen 72%, Russian 12%, Uzbek 9%, other 7%. Health (2007 est. ): Infant mortality rate—53.49/1,000. Life expectancy—68.3 years. 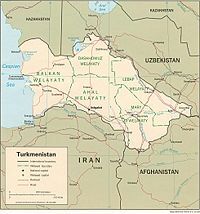 Although the constitution declares the country to be a secular democracy and presidential republic, Turkmenistan is an authoritarian state that was dominated by its first president, Saparmyrat Niyazov, who retained his monopoly on political power until his death on December 21, 2006. The Halk Maslahaty (People's Council) decided on December 26 to select Niyazov's successor through public elections on February 11, 2007. Gurbanguly Berdimuhamedov became president through a public election in which the population eagerly participated, even though the election did not meet international standards. Government efforts continue to focus on fostering centralized state control. Of the country's two parliamentary bodies, the 2,500-member People's Council is the supreme legislative body and surpasses the 50-member Mejlis (parliament) in authority. The president controls the parliament and the judiciary. The civilian authorities maintain effective control of the security forces. Neither independent political activity nor opposition candidates are allowed in Turkmenistan. The Democratic Party of Turkmenistan (DPT) is the only legal political party. Political gatherings are illegal unless government-sanctioned, and the citizens of Turkmenistan do not have the means to change their government democratically. On November 25, 2002, an armed attack against then-President Niyazov's motorcade occurred, and the Government of Turkmenistan moved quickly against perceived sources of opposition. There were widespread reports of human rights abuses committed by officials investigating the attack, including torture and punishment of families of the accused. The Government of Turkmenistan denied the charges, but refused to allow independent observers at trials, to accept a mandatory Organization for Security and Cooperation in Europe (OSCE) fact-finding mission, or to permit the International Committee of the Red Cross (ICRC) access to prisons. It also instituted new measures to stifle dissent and limit contact with the outside world. While the constitution provides for freedom of the press, there is virtually no freedom of the press or of association. The government has full control of all media and restricts foreign publications. International satellite TV is available. The population is 89% Sunni Muslim. The constitution provides for freedom of religion and does not establish a state religion; however, in practice, the government continues to monitor all forms of religious expression. Amendments to the law on religious organizations adopted in March 2004 reduced membership requirements from 500 to 5 for registration purposes. All groups must register in order to gain legal status with the government. Until 2004 the only religions that were registered successfully were Sunni Islam and Russian Orthodox Christianity. By January 2006, nine minority religious groups had registered. The government limits the activities of unregistered religious congregations by prohibiting them from gathering publicly, proselytizing, and disseminating religious materials. A Soviet-style command economy greatly limits equality of opportunity. Industry and services are almost entirely provided by government or government-owned entities, while agriculture is dominated by a state order system, mainly for wheat and cotton. Women face discrimination, and their freedom is further restricted due to traditional socio-religious norms. All citizens are required to carry internal passports, noting place of residence. President Niyazov introduced a new migration law in late 2005 that suggested a reimposition of exit restrictions on Turkmen citizens. As of August 2006, the law was not fully implemented and its effect remained unclear. In July 2007, the government rescinded the requirement for citizens to acquire visas for travel to border areas. Corruption is pervasive. Power is concentrated in the president. The judiciary is subservient to the president, with all judges appointed for 5-year terms by the president without legislative review. Turkmenistan's declaration of "permanent neutrality" was formally recognized by the United Nations in 1995. Although the Government of Turkmenistan has favored high-profile purchases from the United States like Boeing aircraft, it has significant commercial relationships with Turkey, Russia, and Iran, and increasingly with China. The government worked closely with the Taliban regime in Afghanistan until September 11, 2001, and until that time had a growing cross-border trade with the regime in Afghanistan. The five states of Central Asia wrestle with sharing limited water resources and environmental degradation caused by the shrinking of the Aral Sea. Multilaterally accepted Caspian Sea seabed and maritime boundaries have not yet been established. Up to now, Iran and Turkmenistan have insisted on dividing the Caspian Sea into five equal sectors while Azerbaijan, Kazakhstan, and Russia have generally agreed upon equidistant seabed boundaries. Turkmenistan is an important supplier of raw materials, especially natural gas, petrochemicals and raw cotton. With the 2006 harvest of 850,000 tons, Turkmenistan is the second largest cotton producer in the former Soviet Union after Uzbekistan. However, the crop yield has been steadily declining since independence because of poor irrigation and management practices. While outside estimates place Turkmenistan's proven natural gas reserves among those of the top 15 of gas-producing countries, Turkmenistan's claims place its reserves at far higher than outside sources consider credible. In January 2005 Turkmenistan claimed its current recoverable gas resources to be as much as 20.42 trillion cubic meters (tcm), but controversy surrounding the as yet unreleased certified audit results of Turkmenistan's single largest field, Dovletabad, casts doubts on the verifiability of Turkmenistan's claims for its total reserves. Despite its non-transparency about gas reserves, Turkmenistan remains the second largest gas producer in the former Soviet Union after Russia. Production figures have been consistently climbing since 1998 when Turkmenistan was virtually cut off from all outside markets by Russia. Turkmenistan's 2006 output was an estimated 67 billion cubic meters (bcm); the bulk of which (42 bcm) went to Russia. Turkmenistan relies almost exclusively on Russia for its energy export routes because most of the pipeline network is laid on Russian territory. Turkmenistan currently holds a contract with Gazprom to supply annually 50 bcm in 2007 through 2009 at $100 per 1,000 cubic meters. Turkmenistan also exports to Iran about 8 bcm a year. Turkmenistan's 2006 oil production dropped by 0.5 million tons in 2005 to 9 million tons. Among other major exports are liquefied natural gas (LNG) and polypropylene. Turkmenistan has taken a cautious approach to economic reform, hoping to use gas sales to sustain inefficiencies in its economy. The private sector remains insignificant, with a substantial private share only in food processing, consumer trade and services. Despite the increased inflow of gas revenue, prospects in the near future are uncertain. Turkmenistan's statistics are closely held state secrets, and published GDP and other figures are subject to wide margins of error. Turkmenistan's unrealistic goal of "self-sufficiency" also artificially sustains the cultivation of inefficient crops, such as wheat and cotton. The 2006 UN Development Program (UNDP) Human Development Report places Turkmenistan in the category of "medium human development" although the unemployment and underemployment rates may be as high as 70%. Turkmenistan has cooperated with the international community to transport humanitarian aid to Afghanistan. GDP per capita (PPP): $8,500. GDP real growth rate (IMF estimate): 6%. Note: official government statistics show 21.4% growth, but these estimates are unreliable. Industry: Types—natural gas, oil, petroleum products, textiles, food processing. Trade: Exports ($5.4 billion)--gas 50%, oil and oil products 32%, cotton 2%. Partners—Russia, Iran, Italy, Turkey. Imports ($3.9 billion)--manufactured goods 65%, consumer goods 34%. Partners—Turkey, Russia, Ukraine, U.A.E, China, United States. The territory of Turkmenistan has been populated since ancient times, as armies from one empire to another decamped on their way to more prosperous territories. Tribes of horse-breeding Turkmen drifted into the territory of Turkmenistan, possibly from the Altay Mountains, and grazed along the outskirts of the Karakum Desert into Persia, Syria, and Anatolia. Alexander the Great conquered the territory in the 4th century B.C. on his way to India. One hundred fifty years later the Parthian Kingdom took control of Turkmenistan, establishing its capital in Nisa, an area now located in the suburbs of the modern-day capital of Ashgabat. In the 7th century A.D. Arabs conquered this region, bringing with them the Islamic religion and incorporating the Turkmen into Middle Eastern culture. It was around this time that the famous "Silk Road" was established as a major trading route between Asia and Europe. In the middle of the 11th century, the powerful Turks of the Seljuk Empire concentrated their strength in the territory of Turkmenistan in an attempt to expand into Afghanistan. The empire broke down in the second half of the 12th century, and the Turkmen lost their independence when Genghis Khan took control of the eastern Caspian Sea region on his march west. For the next seven centuries, the Turkmen people lived under various empires and fought constant intertribal wars. From the 16th century on, Turkmen raiders on horseback preyed on passing caravans, pillaging and taking prisoners for the slave trade. In order to consolidate the Tsarist Empire in Central Asia, and upon the pretext of freeing Russian citizens from slavery, Russia sent forces to Turkmenistan, and in 1881 fighting climaxed with the massacre of 7,000 Turkmen at the desert fortress of Gokdepe, near modern Ashgabat; another 8,000 were killed trying to flee across the desert. By 1894 imperial Russia had taken control of Turkmenistan. The October Revolution of 1917 in Russia and subsequent political unrest led to the declaration of the Turkmen Republic as one of the 15 republics of the Soviet Union in 1924. At this time the modern borders of Turkmenistan were formed. The Turkmen Republic was under full control of Moscow, which exploited its raw material resources for the purposes of the Soviet Union. Sovereignty was only a formality since Russia ultimately ruled all Soviet states. Following the end of the Cold War and the breakup of the Soviet Union, Turkmenistan declared its independence on October 27, 1991. Saparmyrat Niyazov became the first president of the new republic and remained the supreme decision-maker, "president for life," until his death in 2006. This page was last modified on 12 July 2017, at 15:53. This page has been accessed 12,028 times.